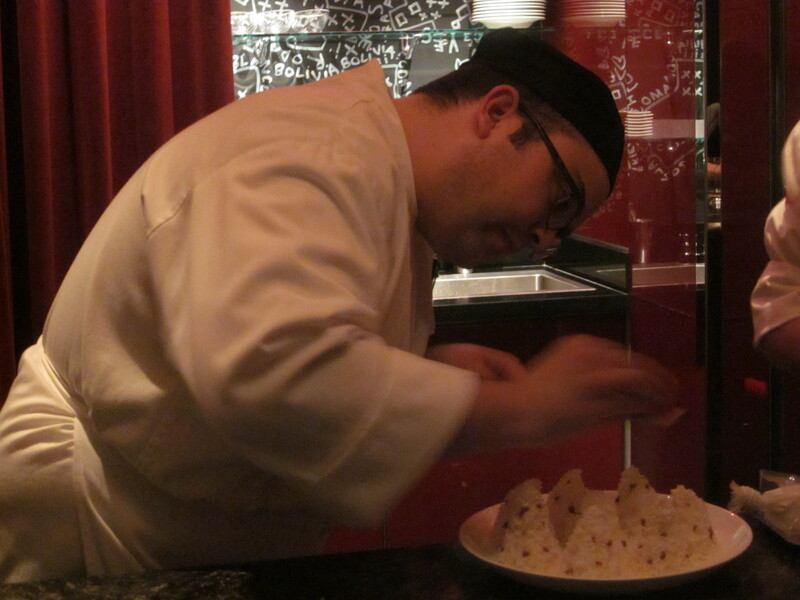 Joseph Mallozzi's Weblog: March 10, 2011: Vegas Day #3! 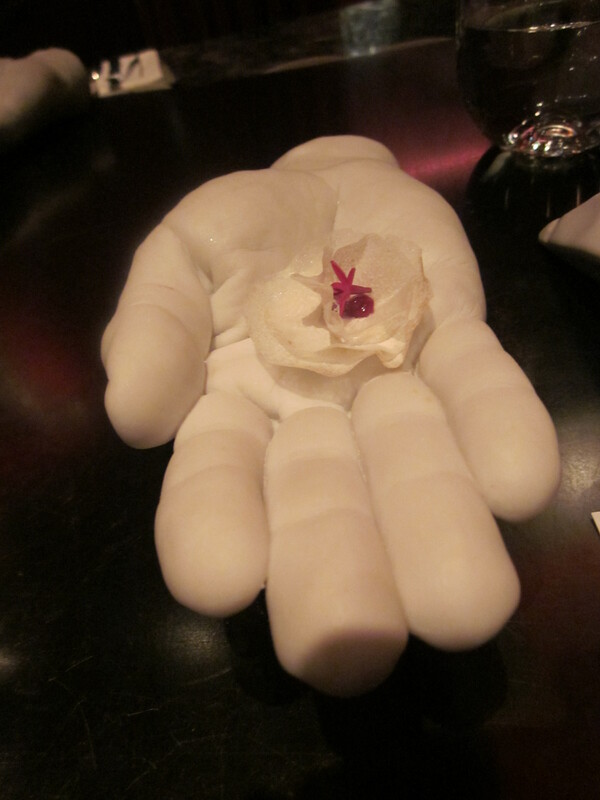 E by Jose Andres! March 10, 2011: Vegas Day #3! 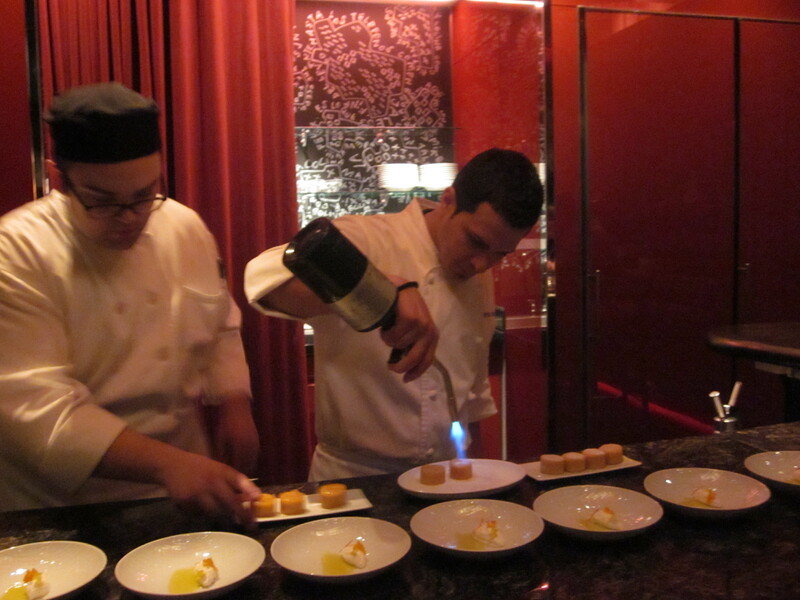 E by Jose Andres! 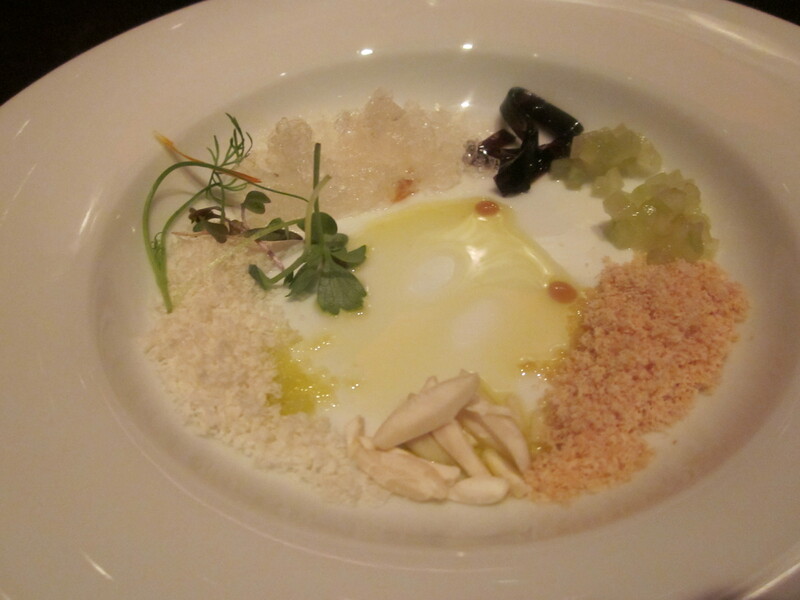 I’ve eaten at several molecular gastronom-themed restaurants over the years (The Molecular Tapas Bar, Les Creations de Narisawa, Aronia de Takazawa) as well as restaurants that have offered occasional molecular-inspired menu items – but these have all been in Tokyo. 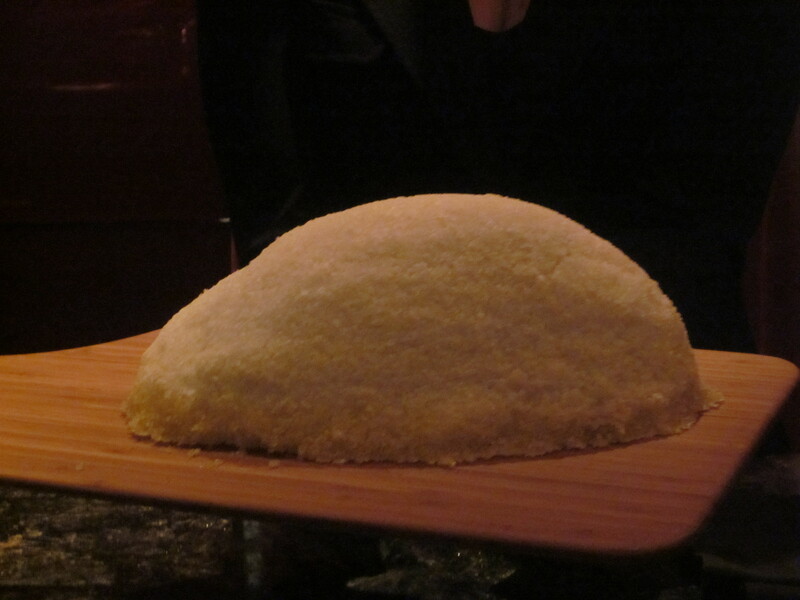 Last night, I finally sampled one in North America when I dined at E by Jose Andres in the Jaleo Restaurant in the Cosmopolitan Hotel. I’ve already explained how I happened across an intriguing passing mention of this (purportedly) secret restaurant, an eight-seater, that can only be booked through a secret email. Fortunately, my google-fu was strong and a search for “e by jose andres secret email” turned up very positive results. I booked and had been looking forward to the meal ever since. 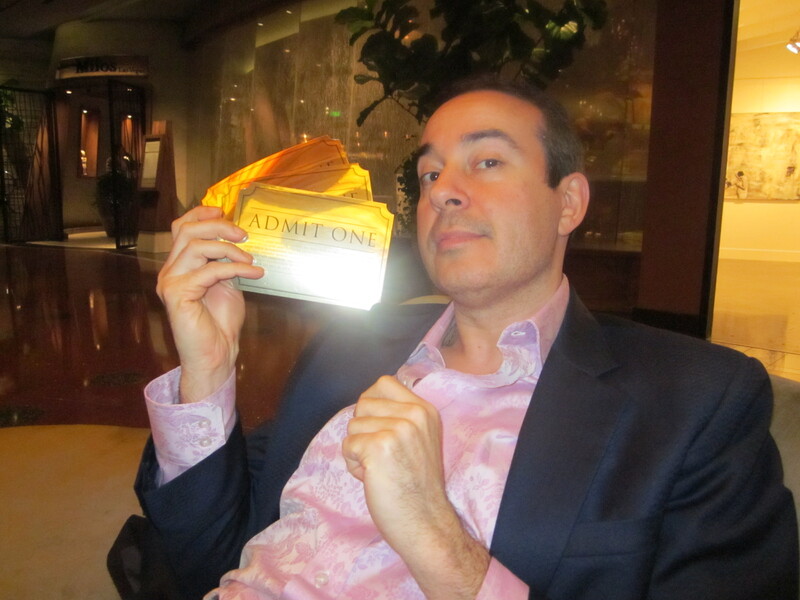 And the recent arrival of my golden access tickets days prior to my departure only intensified the excitement. I never thought my life could be...anything but catastrophe...but suddenly I begin to see a bit of good luck for me...'cause I've got a golden ticket...I've a golden twinkle in my eye. As much as I was looking forward to this meal, I’d say my fellow foodie Martin Gero was equally thrilled at the prospect of the culinary theatrics that lay ahead. We arrived, as instructed, well in advance of our seating, and enjoyed a drink at the bar while we waited for the rest of our dining companions to show. This would be theater after all. Delicious theater, but theater nevertheless, and the audience would have to be seated before the show could commence. Our view of Jaleo, the restaurant within which E is located. 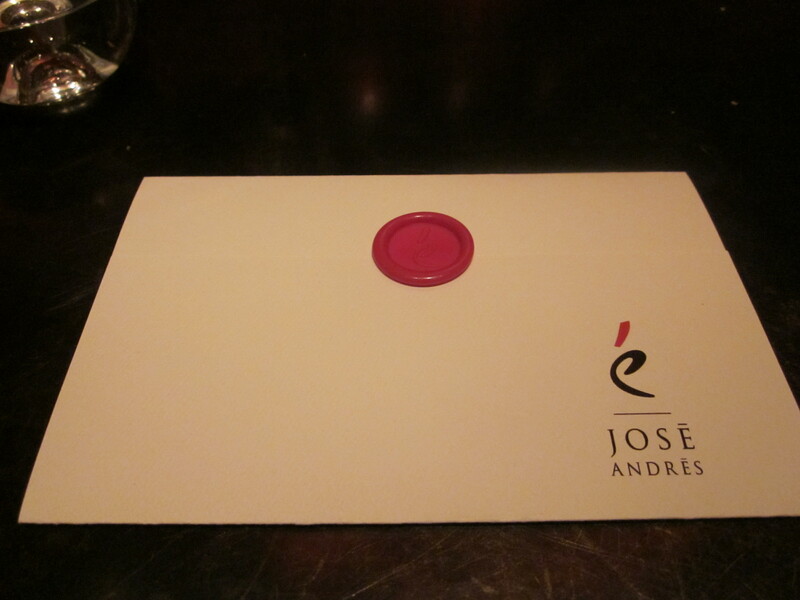 Also a Jose Andres joint and one I'm making a point to check out the next time I blow through town. When the rest of our dining party showed, we were finally ushered through an innocuous-looking door and into the mini restaurant comprised of bar seating which allowed all participants an unobstructed view of the proceedings. 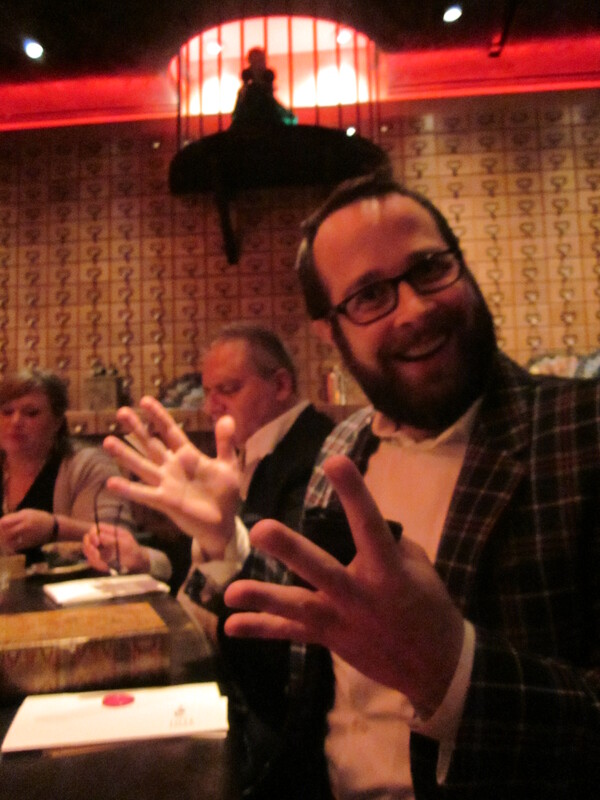 As we prepared for our meal, I asked one of our genial servers, Anthony, about the presumed “no picture” policy. He explained that flash photography was not permitted (understandable in most high end restaurants) and that while the snapping of the occasional pic was not frowned upon, incessant photography, it was felt, tended to detract from the meal. “Bloggers,”he confided. 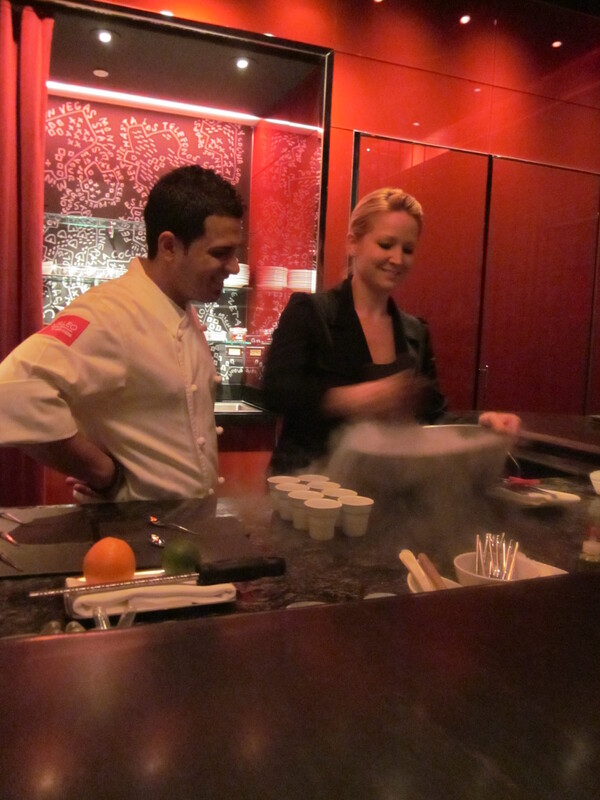 Stephanie kicks things off by concocting a wicked brew using liquid nitrogen and sangria. Frozen Sangria and Grilled Strawberries. The warm sweet strawberries were in marked contrast to the boozy sangria that had the consistency of a slushy - albeit an adult slushy. To be honest, I'm not a fan of sangria, but I do like it in slushy version. 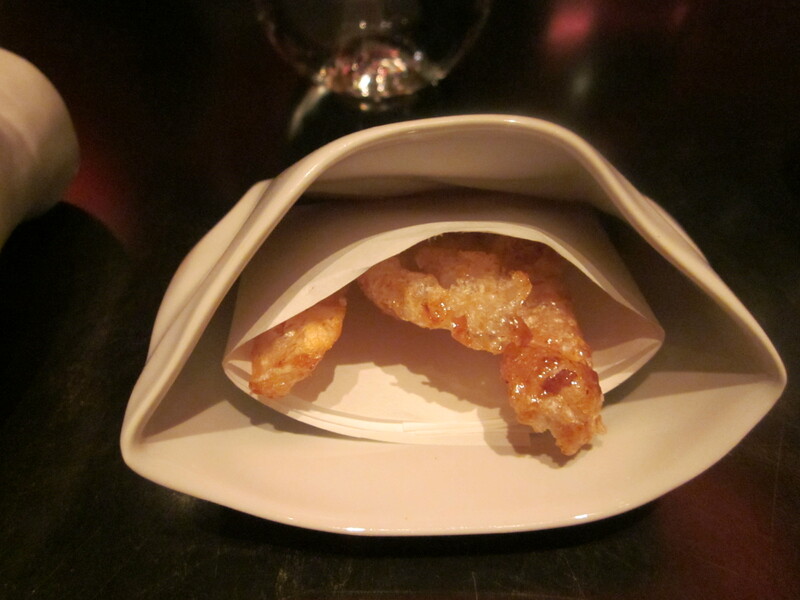 Caramelized Pork Rinds. The lightest pork rinds I've ever eaten, both sweet and savory. If they sold these at the concession stand, I'd start going to see movies at the theater again. Spanish "Clavel". 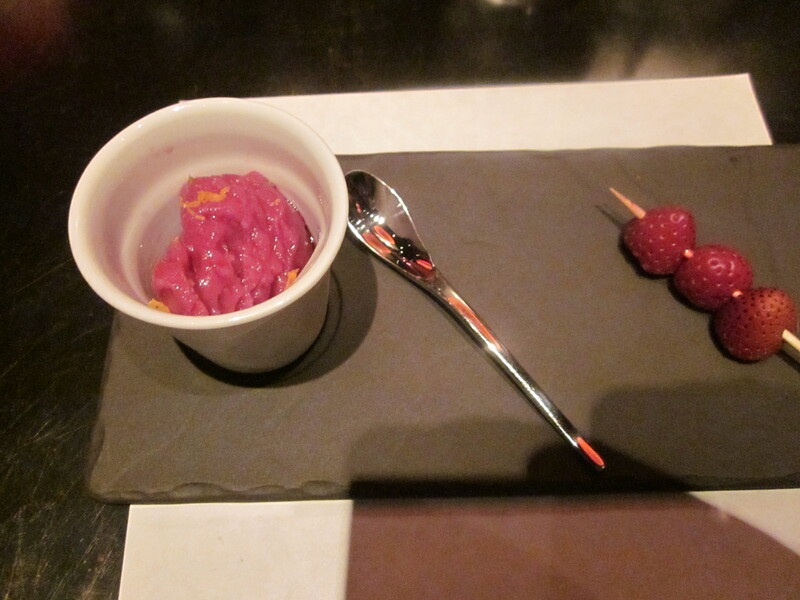 Named after a flower, the dish is actually - if memory serves me right - papered yogurt. Melt-in-your mouth sweet and slightly sour. Beet Jewlery. 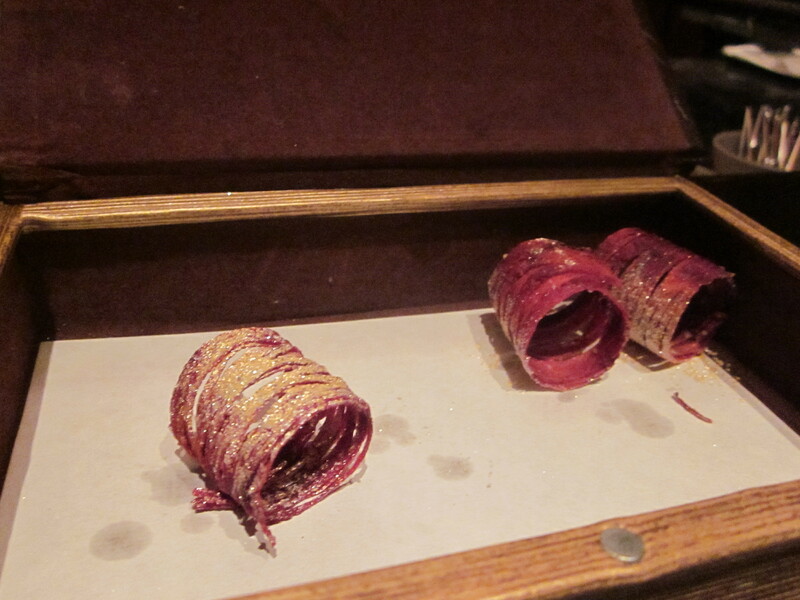 Served up, appropriately enough, in a jewlery box: dehydrated beet curls sprinkled with gold dust. It packed so much intense sweet and salty beet favor in such a tiny crispy bite. One of my favorites. Membrillo and La Serena Cone. 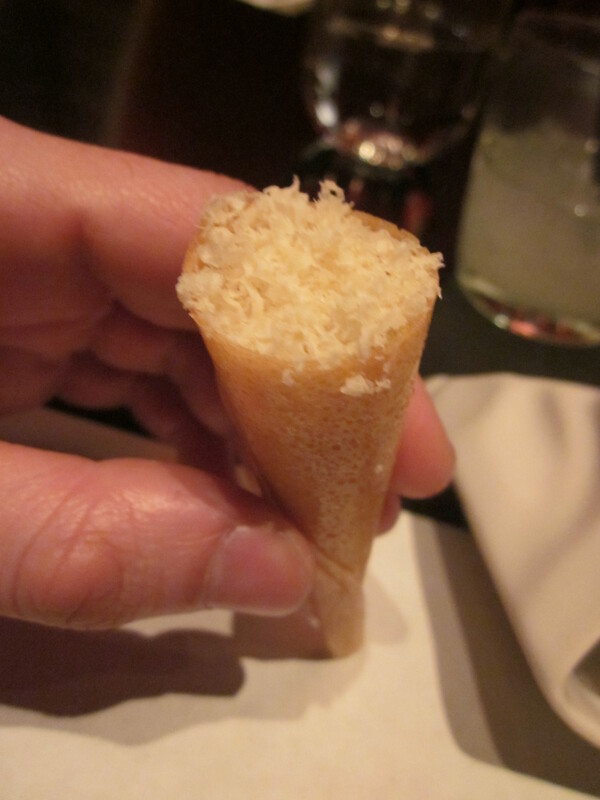 Quince and La Serena cheese in a sweet cone. 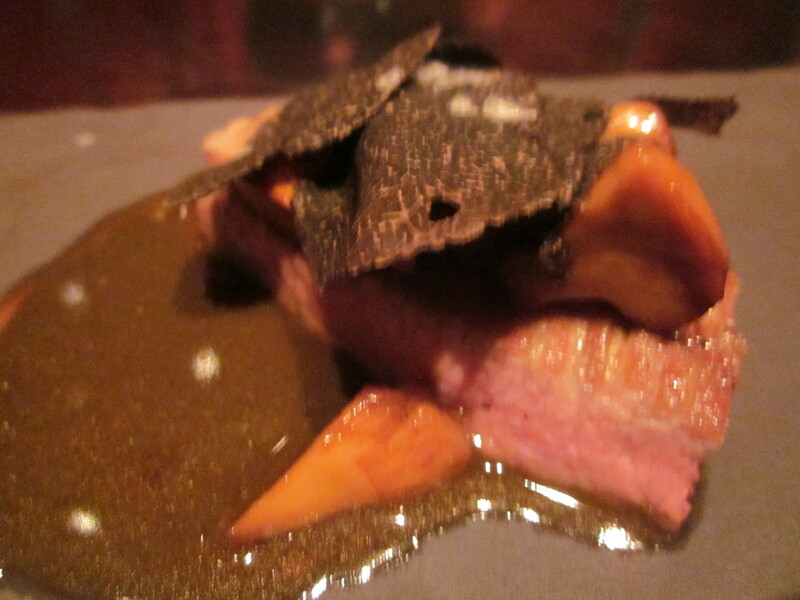 Another contrast of tastes (sweet, salty, slighly sour) and textures (creamy, crispy and crunchy). 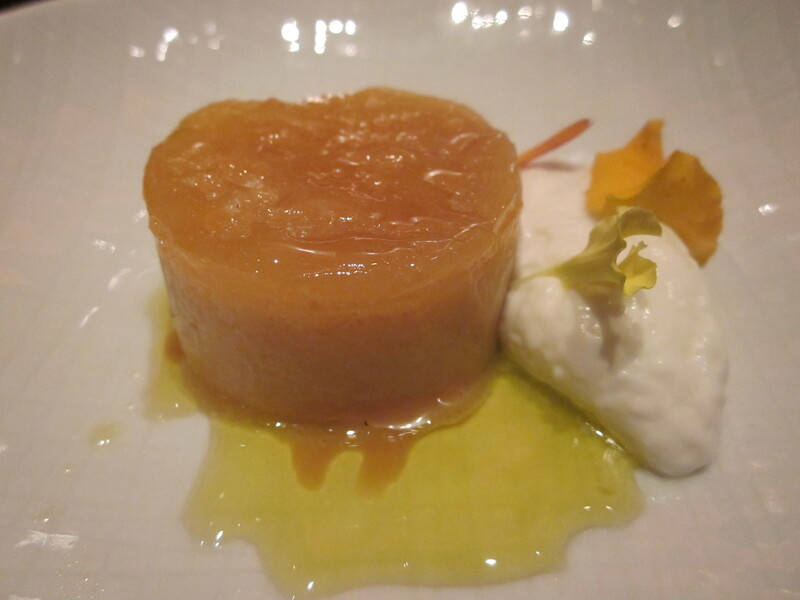 Apple "Brazo de Gitano". 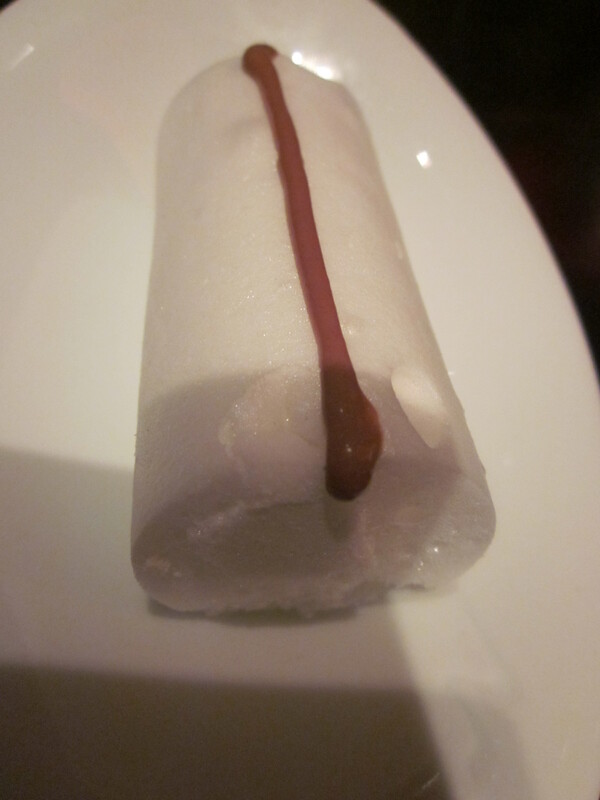 This one is hard to describe - the cheese espuma was injected into the light firm foam that instantly dissolved in my mouth. Another intensely flavored dish that also ranked as one of my faves. Jose Taco & Artichoke with Caviar. Fried artichoke and caviar. 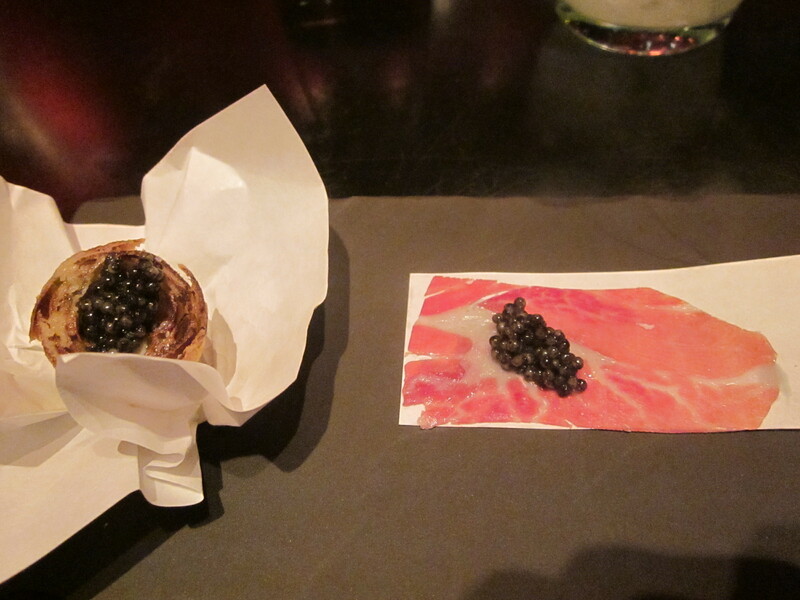 Iberico-wrapped caviar. Phenomenal. Akemi's favorite. Bocata de "Calamares". Actually, an uni roll - fried sea urchin, aioli, and cucmber in a mini brioche baguette. Yet another favorite. I haven't stopped thinking about this dish and am already thinking about how I can replicate it back home. 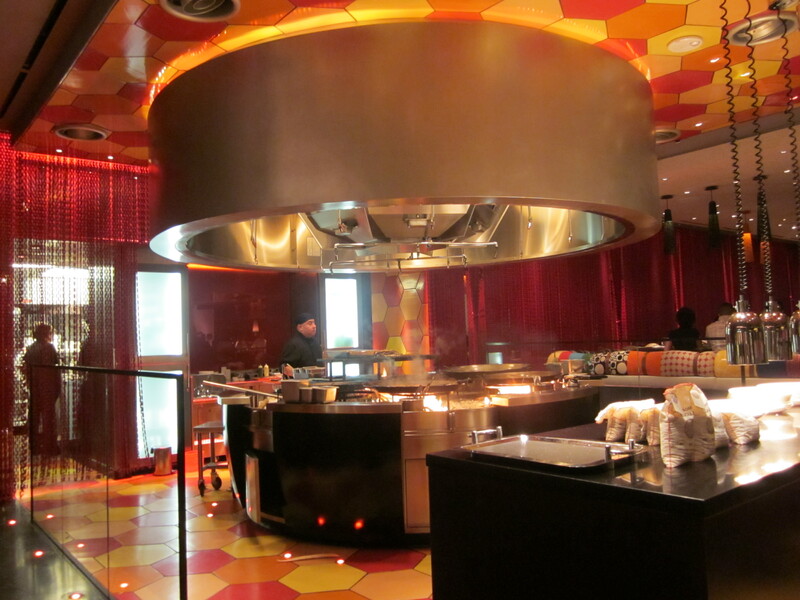 It turns out that two of my fellow diners were also visiting from Vancouver – and were hitting the same restaurants we were on this culinary circuit: e by Jose Andres, Guy Savoy, and Joel Robuchon. Ellaine and Yonnie from Van City. According to our server, Stephanie, the restaurant has entertained a disproportionate number of guests from Canada – clearly home of the foodies. Ajo Blanco. Bead, nuts, olive oil and a couple of mystery ingredients I don't recall. Finished with almond milk. Interesting but not among my faves. 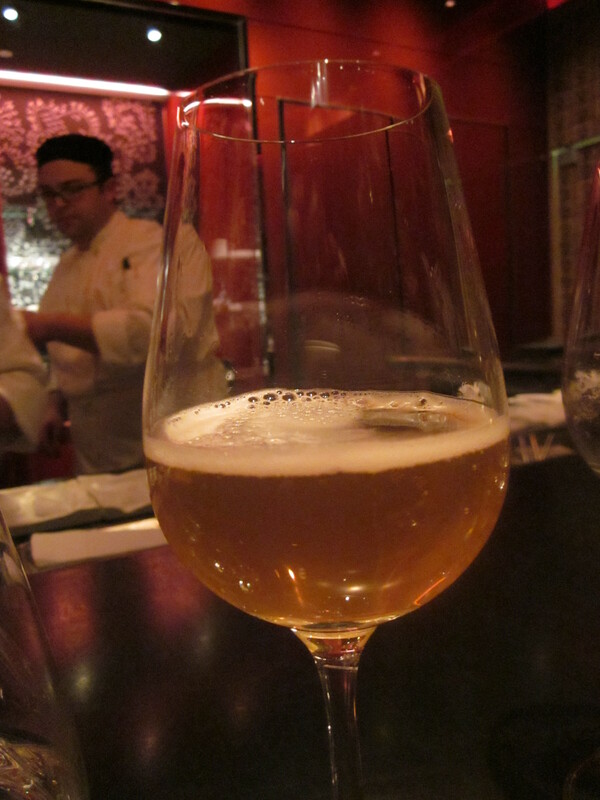 Jose Andres' beer. Apparently, he created it to specifically pair with certain foods. I'm not a huge beer drinker but thought this version was qutie tasty and very drinkable. Santa Barara Spotted Prawn with Roses. 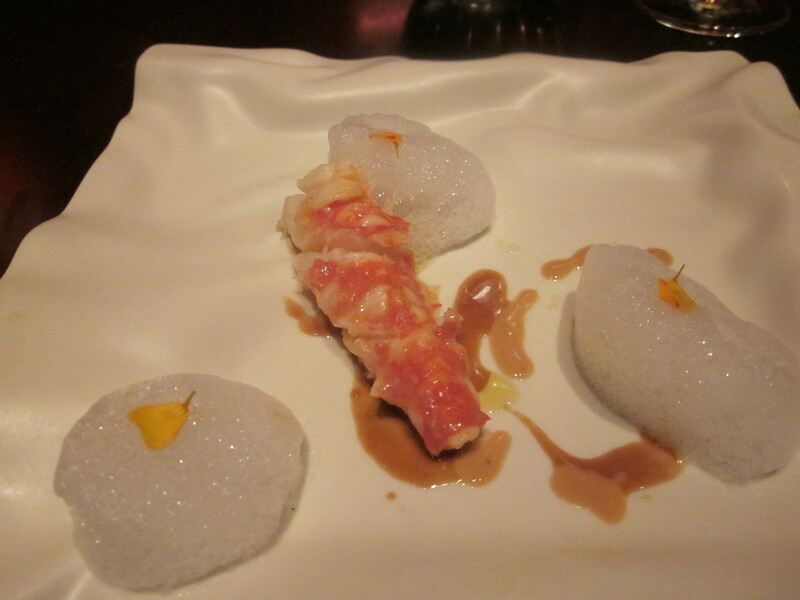 Langoustine served in a sauce made from the head of the langoustine and accompanied by dollops of rose foam. The rose flavor was very subtle and I almost missed it entirely. The langoustines were delicious. Smokey Oysters in Escabeche. 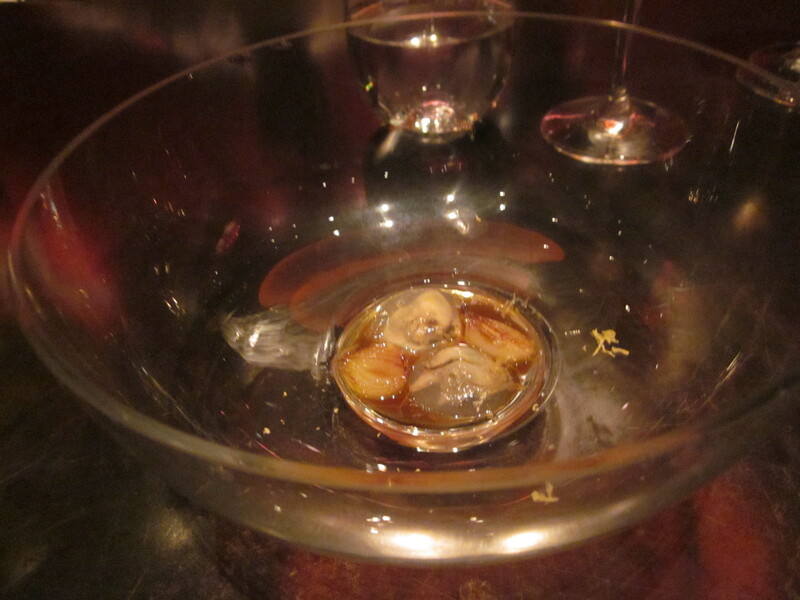 Oysters were encased in a gel of their liquor and smoked along with some pearl onions. Topped with toasted honey air. Catch of the Day. 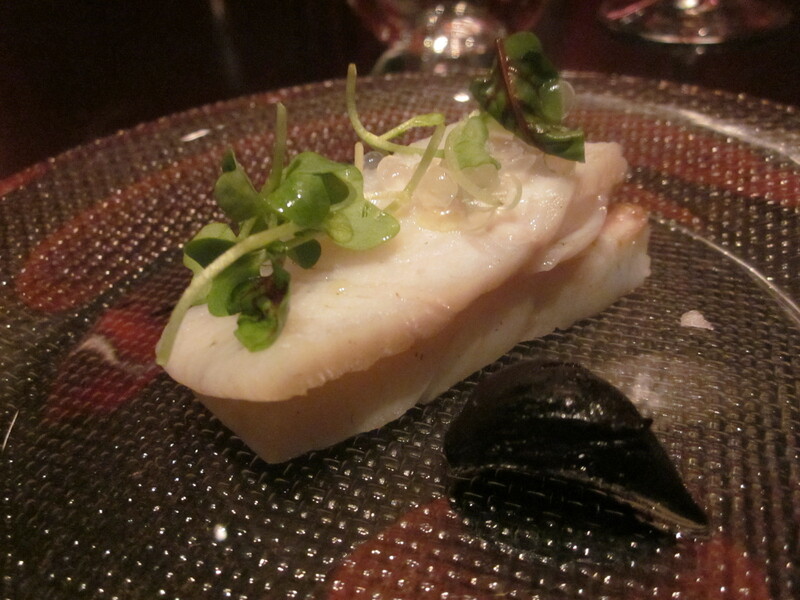 Turbot served with black garlic and topped with citrus pearls. 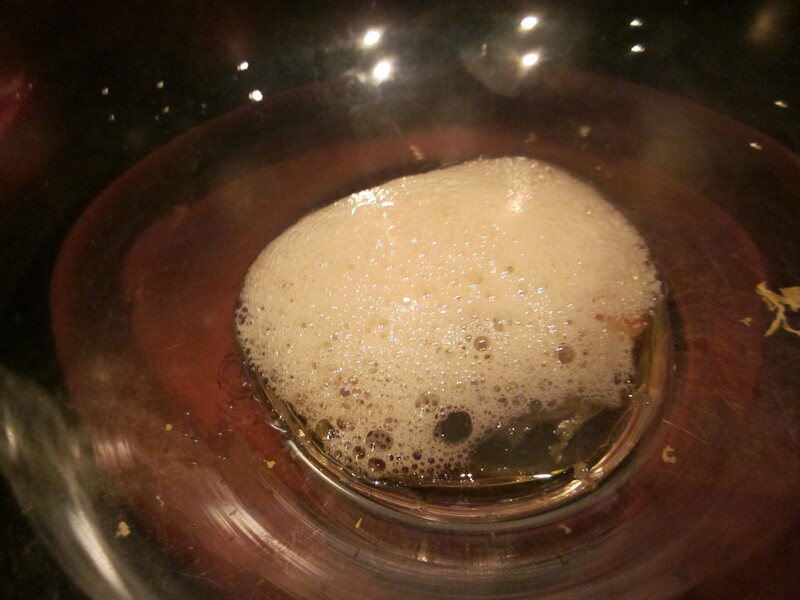 A wonderfully accomplished dish, its ingredients coming together with surprising subtlety. And served with an orange sauce. 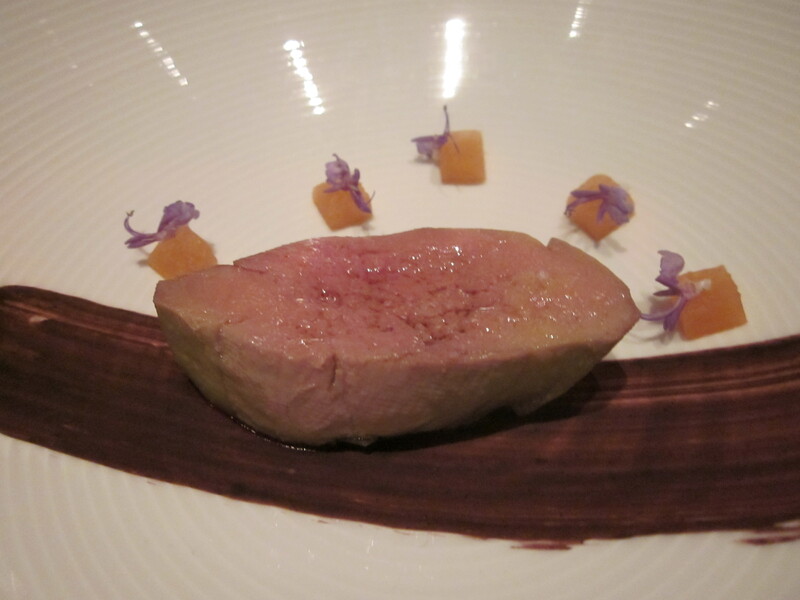 Probably the lightest foie I've ever had. 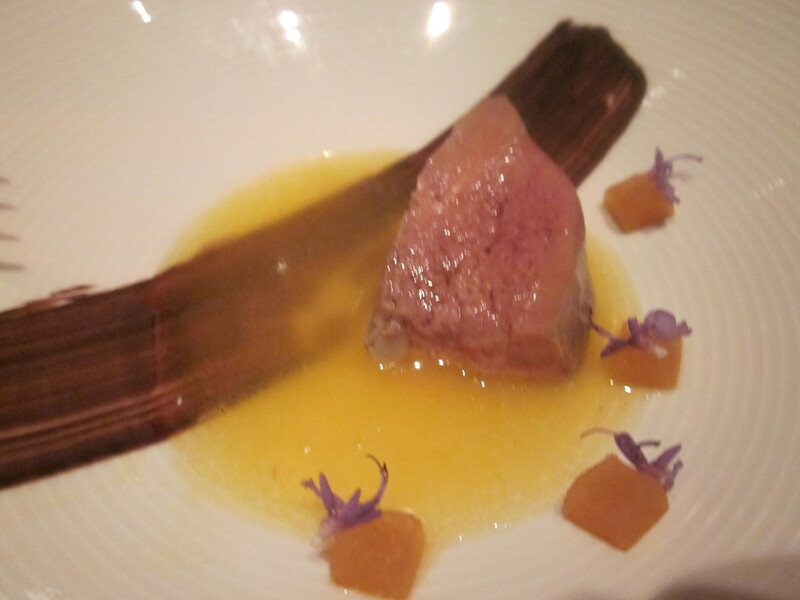 Secreto of Iberico Pork. 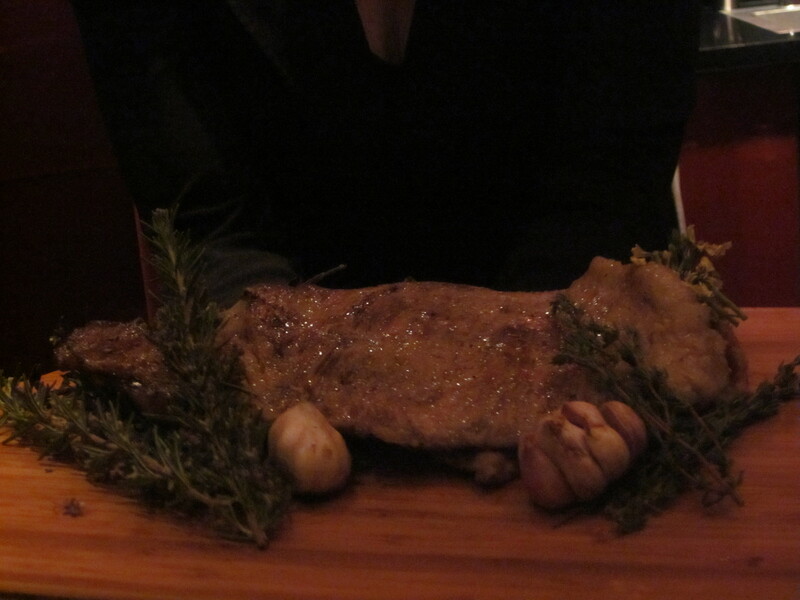 It's called "secreto" because, apparently, not many know about the meat sourced from between two layers of fat from the pig's shoulder. 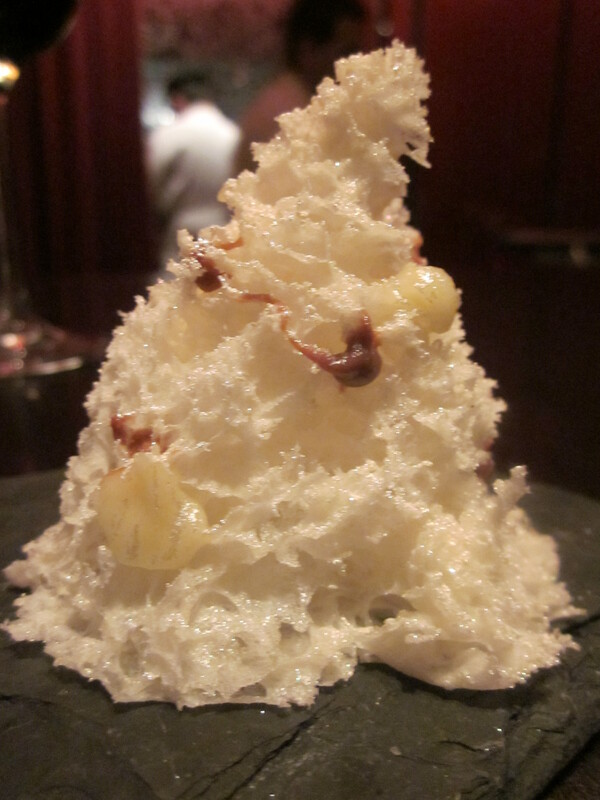 Interestingly enough, the only other time I tried the Secreto of Iberico was at another molecular restaurant - The Molecular Tapas Bar in Tokyo's Madarin Oriental Hotel. Orange with Puree La Serena. 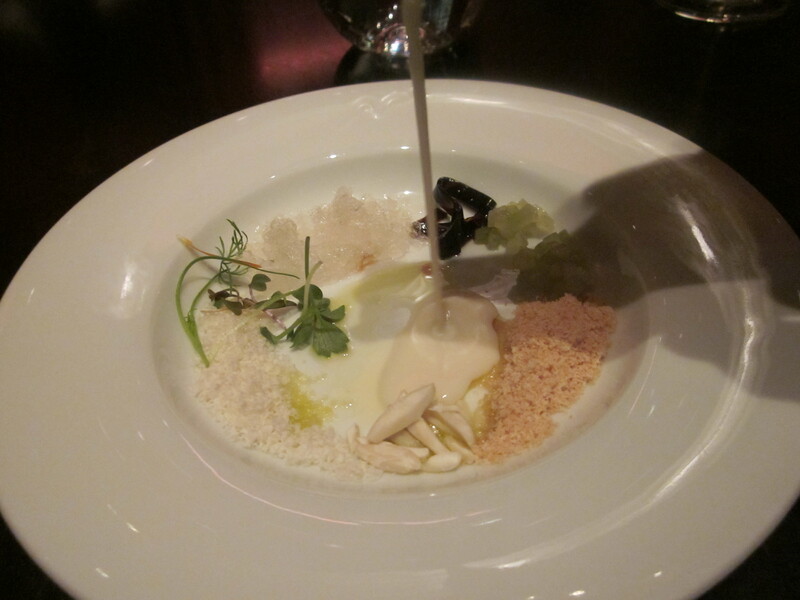 La Serena cheese served with an orange puree, topped with basil and pumpkin seeds. Frozen Apricot Coulant. 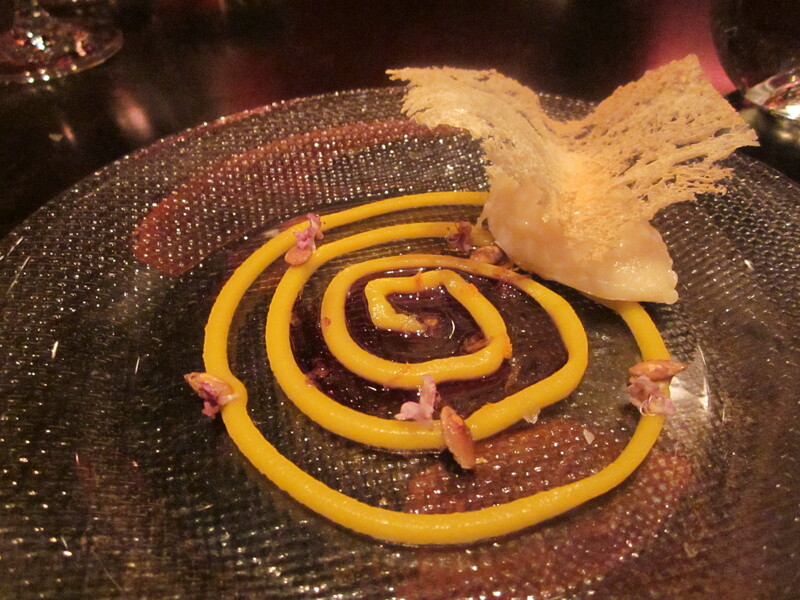 A fruit-based version of the molten-centered chocolate cake was one of the stand-outs of the evening. I never thought I’d say this, but I preferred this version! Pedro Ximenez 1982. 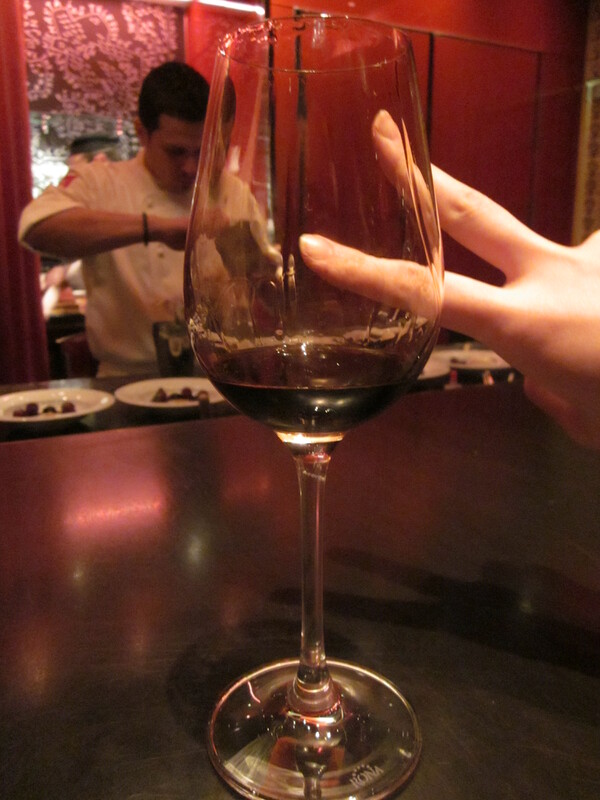 One of my favorite dessert wines! Apples & Red Wine "Fredy Giradet". 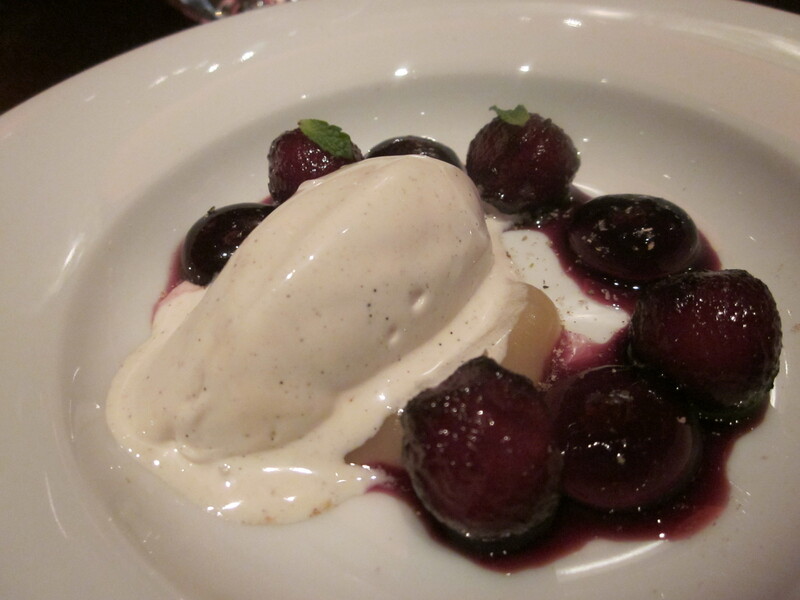 Vanilla ice cream with apples two-way - apple spheres and apple jelly encased in gel capsules. 25 Second Bizcocho. Cooked for twenty-five seconds in a microwave. Tasty, very unique. Our affable hosts take a bow. To finish - Chocolates. Saffron milk chocolate and dark chocolate "air" with sea salt. My culinary wingman is BACK and flying in high style! What a dinner! What a show! 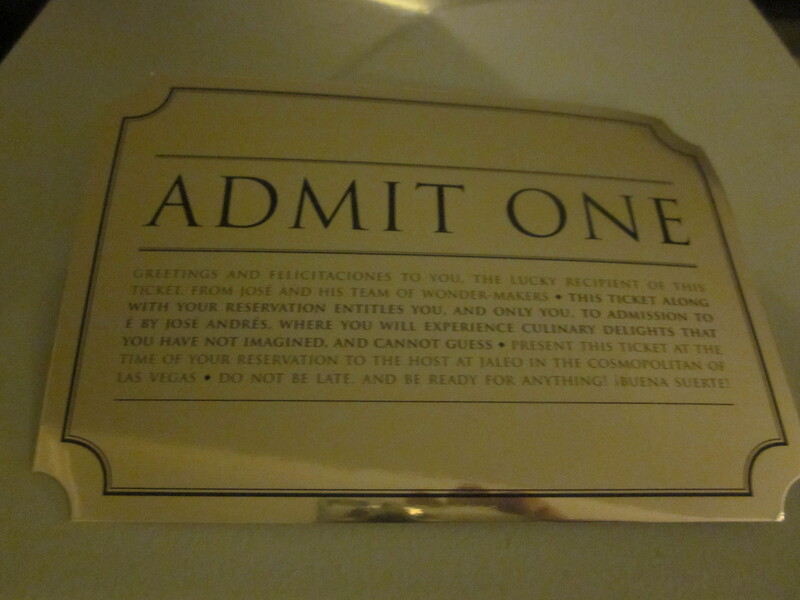 Previous Article March 9, 2011: Vegas Day #2! 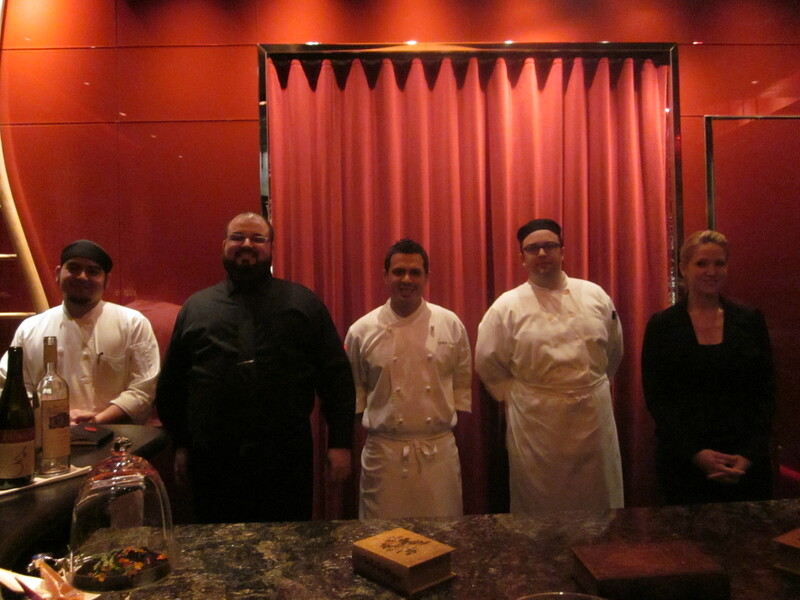 Dinner at Joel Robuchon! Next Article March 11, 2011: Vegas Day #4! Restaurant Guy Savoy! I think that classifies as ‘incessant photography’. What a lovely, unique meal. Thanks for sharing, and for being the obnoxious guy at the table taking all the pictures. Looks amazing! Also, I love that a simple Google search conquered the secrecy. Not too long ago, you listed Stephen King’s Misery among your top reads for 2010 (I believe it was), so partly because of that and partly because I once caught the movie and liked it, I finally read it. *spoiler alert for those who haven’t read it* I quite liked it. I’m not sure I can say I *really* liked it, because I don’t know that I can *really* like horror. It’s just hard to really be excited about a book when I don’t particularly like any of the characters. But I can’t say anything bad about this novel either. I liked that it only had basically two characters (I got a little lost reading ‘Salem’s Lot), and I liked that in the end, everything worked out about as well as it could have hoped to (the main reason I didn’t like Thinner was the ending, and I’ve only read three of King’s novels so far). And it certainly was exciting. And as much as I can imagine the horror of that scenario from a writer’s POV, as a fan who knows the anger of a beloved character being killed off (many times over), a very small part of me can at least sort of sympathize with Annie–which in itself is somewhat horrifying. I can’t help but think that, in the end of that book, there were less crazy fans of the protagonist who would never admit to anyone that, deep down, even though they knew what happened to him was horrible, they couldn’t entirely wish it hadn’t happened, since they got a new book out of it and their favorite character was brought back to life. Anyway, just wanted to voice my thoughts somewhere, and I can’t offhand think of anyone I know who’s read it. I can’t imagine coming up with these fantastic dishes. That little uni sandwhich looks tasty, will also have to concoct my own albeit the Wal Mart version. I’m also gonna pick up a slice of apple-cherry pie from the bakery and some nila ice cream to go with it; not close to the apples and red wine delight from E but will hit the spot. the great images and related information. Looks amazing Joe. I hope Akemi’s family and friends as well as your friends and associates in Japan are all fine. What a scary situation. Dinner looks like it was lovely, but Joe, “jewlery”? Really? You? Thank you for the pictures of your dining experience at E.
On a more serious note, my thoughts are for Akemi, her family and friends, and I hope they are all okay. Joe, Akemi – I just heard an 8.9 quake and tsunami has hit Japan, north of Tokyo. I hope any friends or family you have there are safe and out of harm’s way. This goes to all who may be affected, since tsunami warning extend all the way to the US (Hawaii and west coast), Mexico, Central America, and even down to New Zealand. I allso enjoyed watching the new SGU Episode! looks like its gonna be an epic second half. i think if the story line picked up more quickly there would be more viewers but on the other hand i think it was nessery to get the viewers in the mood of this new stargate feel. i kind of dont want to wacht the second half knowing it wil end in a massive cliff hanger with no chance of knowing how it will end! i really liked the idea of a 5 season story with a beginning and an end. I allso have a question for your mailbag. If you had to pick a super hero team for a new series and it had to be comic/movie/tv series characters who would you pick? Goodluck in vegas, maybe you get lucky and win back all your dinner money! Sorry for my bad english, its not my native language. Nice! The food presentations were great, and I enjoyed seeing the process too. Hope your trip continues to go well. Just hoping all of Akemi’s family and friends are safe back in Japan! Thinking of her and everyone affected. wow. glad you were allowed to take pictur, and shared with us. And by hook or by crook I will find a way to try that restaurant out in the future. In the meantime< I've awakened to the horrible news from Japan. I can only hope people pay attention to the tsunami warnings and help minimize the death toll, and count on the unparallelled competence of the Japanese to handle this kind of disaster. @To finish – Chocolates. 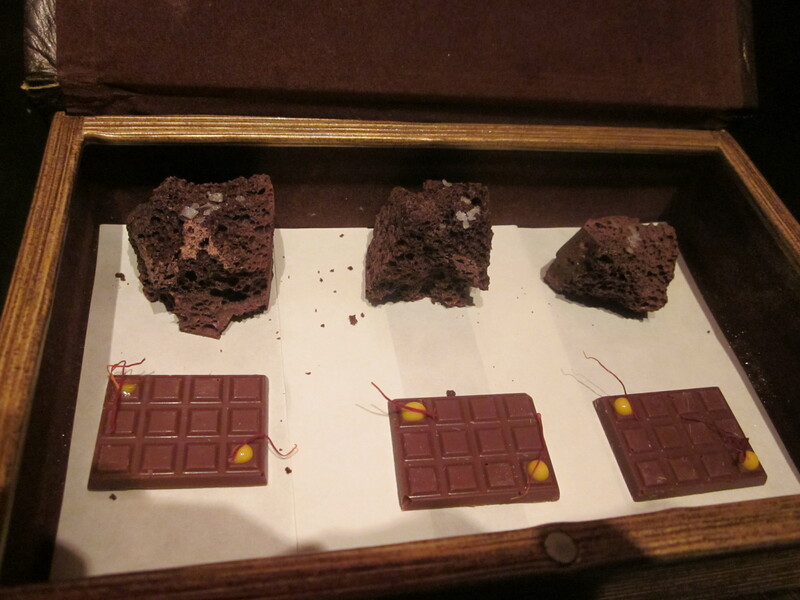 Saffron milk chocolate and dark chocolate “air” with sea salt. I love chocolate, those look amazing, okay I don’t eat much but am wondering, are those rock like things above the bars of chocolate actually chocolate? They don’t look like it. Oh and did you hear, a Magnitude 8.9 Earthquake hit the Northeast coast of Japan today, the strongest in the countrys history. It’s on virtually all the news channels/websites, but if you’re busy you may not of seen. It must have been a great food experience. Thanks for sharing! Prayers around the world for the tsunami and earthquake. Very sad…..
That was amazing! Thanks for taking us along for the ride, Joe. i just heard about the massive quake in Japan. i hope that the family of Akemi is allright aswell as all your friends/ Favorite restaurants! – best wishes to all the victims and family of the quake. I hope you showed your appreciation of the golden ticket by eating everything put in front of you, wow. 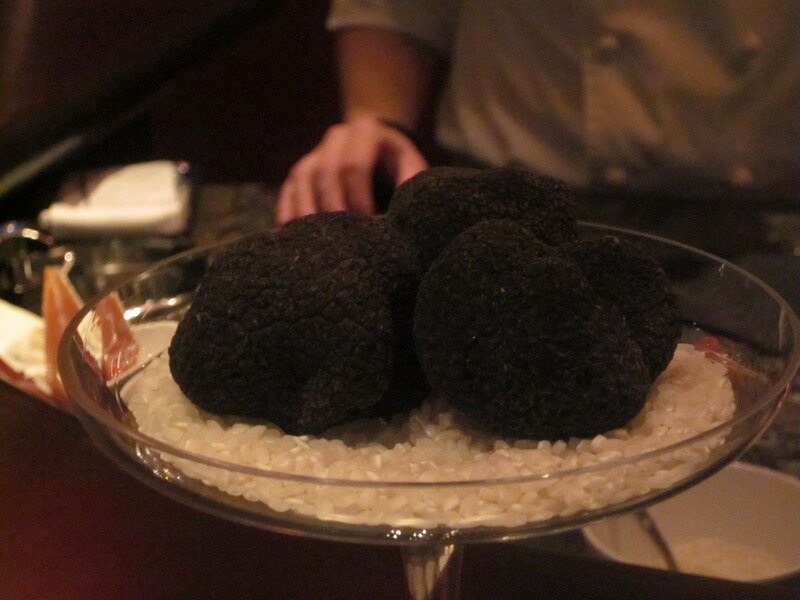 those truffles looks amazingly large. thanks for sharing. Marty looks so what is the word I am looking for,,,spiffy in his attire. Very spiffy.! Glad to see you are enjoying your visit. Have you dropped a coin into any slots to hit a big jackpot>? aside,, many prayers for the people of Japan, earthquake a deadly tsunami,. Joe, that meal looks amazing! Very impressive, and well worth the hurdles. 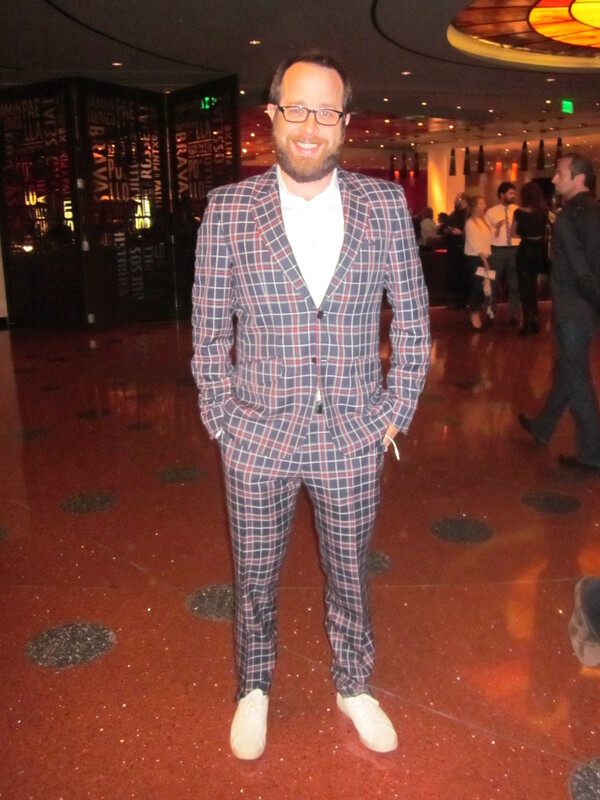 Martin: Great suit! No, really! Also, good thoughts to Akemi in case anyone she knows was affected by the massive earthquake and tsunami that hit Japan yesterday. Holy. The Japan news gets worse every moment, 10m high waves hit Sendai and other locations of Japan they call it a Tsunami, crazy news, 100s of people dead, cars, boats, houses just floating away. Millions of homes in Japan without power, Tokyos cell phone network crippled due to everyone calling each other at once. Seems a lot of places in the pacific areas have tsunami warnings including places like Hawaii, and other Asian countries and I believe some coastal areas of Canada? 18 odd aftershocks were reported in Japan. Anyway figured il’d mention incase anyone else hasn’t seen the news. Thank you so much for sharing this with us. I just sent off my email to them for my trip to Vegas. I am always looking for interesting food. I was struck by was how it seemed like there was more balance in the tone of the show than before. The trend in this direction probably started a few episodes before the hiatus. I get the sense that there was one big complaint about SGU over the last couple years that you heard more than any other. Granted there are alot of shows out there that do “dark” well. But there were so many thing’s working against that here. That the ship itself is this uber dark back drop for practically everything that happens on the show. A dark ship zipping around against the darkness of space. Thats a whole lotta dark before your characters even consider what the story is about. And then the story is seriously dark too. I mean there’s only so much of that you can take before you OD. Plus, Stargate has always impressed me most with how well it was able to balance the drama and the humor. It’s a really hard thing to do. You could watch one ep of SG and get it all. There would be serious peril for the characters and you took that seriously but the ability of these characters to make some jokes along the way made the point that these people were so good at their jobs that they could kid around a little bit even in these really scary situations. So with a dark set against a dark backdrop…you’ve kinda used up your quotient of darkness for any given episode. At that point the viewer wants to see some contrast. Some hope. That’s what I have been seeing in the last 4 or 5 eps. The crew behaving more like a team. Rush showing a more hopeful outlook. He and Col Young working together. Chloe getting sorta cured so she still has something vital to contribute and they don’t have to put her off the ship. I get that all of this is academic now since the show is over for the most part but I just had to share. Hopefully this direction will continue all the way up to the end so that by the time its over people will be much sorrier to see it go.